IT convergence is not new. The concept has been around since IT became mainstream. Mainframes centralize compute power and introduced the concept of time sharing. Mini computers centralized applications. But with the PC boom, the IT infrastructure became decentralized and distributed. Although compute power and storage became less expensive, management and maintenance have ballooned costs. This saw the IT industry introduce converged infrastructures. With promises of better economies of scale, improved resource utilization and granular management, IT convergence shaped the way companies built their IT infrastructures. Today the need for IT convergence is more about business rather than IT. While improving IT infrastructure management is a key goal, its ability to help companies rationalize their current investments and elevate business agility was key to its adoption. As many participants noted at a recent roundtable, organized by EMC and Avnet, it boils down to simplifying complexity. “Customers care less about infrastructure; they care more about functions and features. 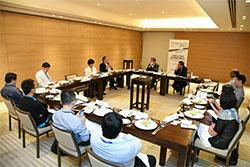 Anything that simplifies IT functions and operations is key,” Roche Singapore head of IT Peng Chen said. “My challenge is server consolidation. My servers are growing fast as we IT enable all our departments, so we need to consolidate our resource,” added Poh Tiong Choon Logistics CIO Poh Kay Leong. According to EMC, infrastructure is no longer the primary motivator for many businesses to converge. “The infrastructure is not the primary. For us convergence is about making what you have better and more sustainable for the future. We going from the concept of the second platform, where we build applications based on what is known, to the third platform where we address unknowns. So for us, convergence is about enabling companies to get the right information to understand what is going on in their business and IT environments,” said Jon Murray, senior director, sales & channel enablement APJ at EMC. “From our interactions with customers, many want to save on labor and management costs, while improving agility and scalability. A converged infrastructure is able to address these needs,” added Celyne Tan, sales director at Avnet Technology Solutions (Singapore) Pte Ltd. While IT leaders are looking to converge, EMC sees hyper convergence as the next logical step. Murray highlighted a customer who had numerous remote offices in Canada. They wanted all their remote offices “to act as one”, but did not want to buy all the necessary hardware and software. “So they wanted to know how they can use what they have and make it better. They were essentially looking for way to build and roll out new applications,” said Murray. It’s a situation that many of the panelists faced. According TEHO International CFO Sian Chin Phua, it is a question that they face every time they evaluate a vendor. “We need to find out who can take us there, and is their approach sustainable,” he added. The question changes with a converged infrastructure solution. “In a converged infrastructure, you have the compute, storage, network and automation all pre-configured and pre-integrated. So you are just buying it in chunks,” said Murray. Hyper convergence takes this promise further. When you need to expand your infrastructure or deploy remotely, “you simply buy more of the same thing,” according to Murray. According to Metricell Asia managing director Ravikumar Jeevarathinam, this can improve return on investments—a key concern for this telco services company who is looking to manage customer churn, reduce time to market, and improve revenues. Jenny Kow, Assistant VP for infocomm systems at The Ascott Limited sees huge potential in hyper convergence in improving scalability and reduce costs, while Donny Wu, Head of Information System, PT. Topindo Atlas Asia sees it resolving headaches in deploying and managing hundreds of servers in diverse locations. MNDY International CEO Wayne Law noted that the agility advantage that hyper convergence will be especially telling as the business environment becomes hyper competitive. “And it is not about just cost either. Cost is always relative. But if your infrastructure is not scalable or agile, what is the use of it,” said Phua. The biggest winners of hyper convergence will be the smaller enterprises. “It is an area of the market where we see the biggest interest and potential,” said Murray.